Speaker Paul D. Ryan’s decision to “run through the tape” and wait until the end of his term to exit Congress makes an already complicated race for his leadership position even more so. With rumors about Ryan’s potential exit from Congress circulating for the past few months, potential successors like House Majority Leader Kevin McCarthy of California and Majority Whip Steve Scalise of Louisiana had begun quietly positioning themselves for a leadership battle. But few expected the real race to replace Ryan to begin now. Rather, the thinking in Washington was that Ryan would run for re-election and announce his departure from Congress in November before intraparty leadership elections. The speaker’s announcement that he will retire at the end of his term has elevated what was mostly private whispers to a public question that has no imminent answer. In addition to McCarthy and Scalise — who for now are publicly declining to say they’re interested in succeeding Ryan — several members said other names have emerged as potential dark-horse candidates. While most declined to reveal those, a few that were shared on the condition of anonymity include a pair of North Carolina members, Chief Deputy Whip Patrick T. McHenry and Republican Study Committee Chairman Mark Walker, and House Natural Resources Chairman Rob Bishop of Utah. Walker, however, downplayed his chances of running, saying he is not sure he is qualified after only being in Congress for three-and-a-half years and lacking the wonkish policy background of someone like Ryan. With Ryan staying on through the end of his term, the leadership election for his successor won’t occur until late November. While that would also have been the case had Ryan waited till after the midterms to announce his plans, his decision to go public now means potential successors need to start building support without even knowing what position will be open. If Republicans hold their majority in November, it will be a race for speaker. In that scenario, candidates have to secure 218 votes to win the speaker election on the floor of the House, which would occur in January on the opening day of the 116th Congress. If Republicans lose the majority, the race to replace Ryan will be for minority leader. That position may be less attractive to some, but it would only require candidates to earn support from a majority of the Republican Conference and not worry about a vote on the floor. “They’re two very different races,” New York Rep. Chris Collins said. House Freedom Caucus Chairman Mark Meadows said the positions could produce different candidates because they require different personalities and different skill sets. It would be much easier to predict Ryan’s successor if Republicans lose the majority in November. McCarthy, as the current No. 2, can likely win a minority leader race. But it’s not clear whether he can win a speaker’s race. The California Republican tried to run for speaker in October 2015 when John A. Boehner resigned the post, but dropped out amid opposition from conservatives, realizing he lacked the 218 floor votes needed. He did, however, appear to have support from more than half the conference, which is all he would need to clinch a minority leader race. Scalise has reportedly said he would not run against McCarthy, although he declined to answer that question Wednesday or even say whether he was interested in succeeding Ryan. “There’s not a race going on,” the Louisiana Republican told reporters as he exited the House chamber after an early afternoon series of votes. Scalise then stopped the conversation with reporters to talk to Rep. Dennis A. Ross, a Florida Republican who also announced his retirement Wednesday. When Scalise returned to the conversation with reporters, he avoided answering the question about his ambitions. “If we start getting sidetracked, focusing on some race that might happen down the road — if Nancy Pelosi is speaker, none of that matters,” he added. For that reason, several Republicans on Wednesday declined to weigh in on the leadership battle. Some, like Texas Rep. Bill Flores, are urging their colleagues to put that conversation aside and focus on getting elected so Republicans can retain their majority. “Otherwise, it is a moot issue,” he said. Intraparty leadership elections are typically held during freshman orientation so that new members get a vote; retiring members do not get to participate. And the speaker’s vote in January is taken by the new Congress. In the Republican Conference alone, 38 members, including Ryan, are either retiring or running for other office. So unless GOP candidates start to weigh in on their preference for Ryan’s successor — and they will likely be asked to — it would be impossible for the current leaders to determine whether they’d have the votes to be elected speaker on the floor. In a speaker’s race, every faction will have sway given the threshold of votes needed to secure the position. The group that could present the biggest problem for Ryan’s potential successors is the hard-line conservative Freedom Caucus. Meadows and Ohio Rep. Jim Jordan, the primary leaders of the caucus, declined to specify a preferred candidate. “Freedom Caucus members will cast their votes for the speaker that best allows for an open process and conservative legislation to move forward,” Meadows said. Other Freedom Caucus members, like Rep. Paul Gosar, are ruling out any current member of the leadership team. The Arizona Republican said he thinks it may be time for an outside candidate, as the speaker does not have to be a current member of the House. Other conservatives aligned with but not a part of the Freedom Caucus, like Rep. Thomas Massie of Kentucky and Walter B. Jones of North Carolina, have also dismissed current leaders. Jones said he doesn’t favor McCarthy but wouldn’t rule out voting for Scalise. Ryan has indicated he may later offer an endorsement in the race to replace him, a move most members said wouldn’t have much impact, but that some conservatives said could detrimental to the person he endorses. If President Donald Trump decides to endorse, his preferred candidate would get a boost, several members said. One thing a lot of members say they’d prefer is to avoid a lengthy leadership race. Ryan said he was told that waiting to retire until after the election was “the politically shrewd thing to do” and that he considered it. That would have prevented him from becoming a lame-duck speaker, something that could hamper the Republican Party’s political and policy ambitions. 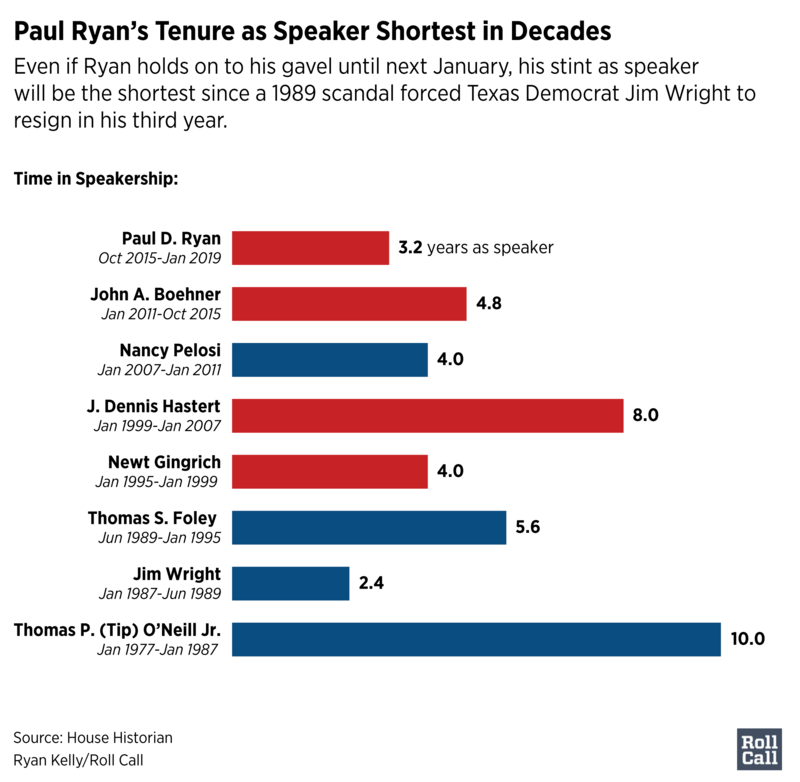 Pressure may mount on Ryan to give up the gavel early. But the scenario more members were discussing is some kind of shadow race in which the next Republican leader will be determined behind the scenes over the next few months. Regardless of whether the race to succeed Ryan is settled in a few months or in November, it likely won’t be pretty. And the longer Republicans allow it to play out, the more chaotic it could become.